Apex Matters is solely supported by advertising dollars. We ask that you support our advertising businesses and help keep our local economy thriving. A huge thank you to the businesses that continue to support Apex Matters every season. 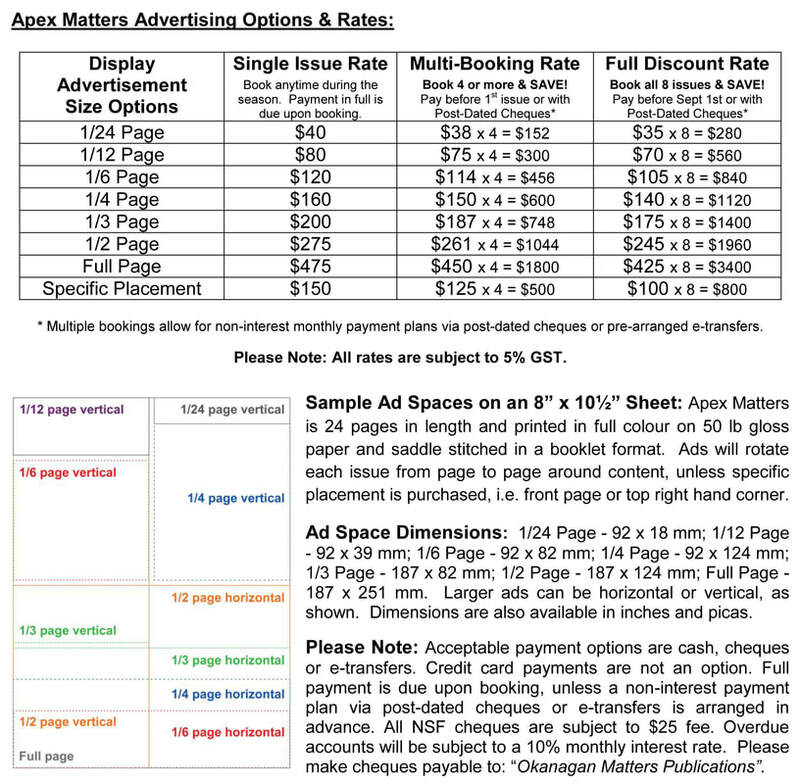 Apex Matters offers a wide range of advertising options. Book from issue to issue, or enjoy discounts with multiple bookings. Space available is based a on 'first come first served' basis. Current advertising details are listed below. Print distribution will cover high traffic locations in Okanagan Falls, Kaleden, Penticton, Summerland, and around Apex Mountain. Our complete route list will be available upon request once confirmed this September. In past years, Apex Matters printed 2500 copies of each issue x 8 issues each season = 20,000 copies in circulation. This newsletter is always kept as a community reference guide, thus benefiting our advertisers by continual repeat exposure throughout each month. Content contribution is always welcomed and strongly encouraged, i.e. letters to the editor, local stories, photos, event information and it’s follow up, etc. Inclusion is based on space available and discretion on content may be involved. If minor editing is done, you’ll be notified. Local non-profit groups can submit editorial information. However, any fundraiser information or display ad space would be considered a paid ad and be subject to 50% off the regular rates. Advertisement rates are based on size of space booked on an 8x10½” page. All advertising for the 2018/2019 season will be printed in full colour. Discounts are available for multiple and seasonal bookings, but only if paid in full or with post-dated cheques. Arrangements for monthly e-transfers are available upon request. All rates subject to 5% GST. Advertisement space rotates monthly, unless you purchase specific placement, i.e. front page. Need more space from time to time? Just let us know to accommodate an ad space upgrade from your regular booking. Ad spaces will rotate throughout the publication from issue to issue, unless a specific placement is purchased. The additional rate for specific placement is listed in the chart below. One hour of creative design work is included with any advertisement booking. Plus, any monthly changes or updates are always included at no extra cost. We will help create your advertising space to best suit your needs. If you have a logo and branding image in place, just forward a .pdf file of your original artwork. Any creative design work beyond one hour is billed at $60/hour and at 15 minute increments. Bleed (full colour to the edge of page) is available for advertising. If you use your own graphic designer, be sure they forward a press quality image. Do you want a seasonal column to expand your advertising space? Advertorials run alongside purchased ad space at no extra charge. Submit your own editorial on your business or have it written for you for a fee of $0.10/word, i.e. 500 words is $50 + GST. Book your ad space and advertorial column now, as space is limited and on a first come first serve basis. Note: Information on businesses will only be included if an ad space is purchased. The 2018/2019 season deadlines for ad copy changes and content contributions start on August 28, September 25, October 26, November 27, December 27, January 28, February 25 and March 26. There will be a period of 5 days following the deadline start dates to get your content submitted. A deadline reminder email will be sent in advance of these dates listed, which will contain the final approval deadline date required before printing. Remember, nothing goes to print without your approval given on a proof provided via email. Payment in full is due upon booking. We accept cash, cheques, or e-transfers for payments due. Sorry, no credit card payments are accepted at this time. NSF cheques are subject to $25 each. Overdue accounts are subject to 10% monthly interest. Non-interest monthly payment plans are available upon request and do require post-dated cheques in advance. Arrangements can be made for monthly e-transfers as well. Newsletters during last season were published monthly from September through April, while the prior three seasons were published twice a month from Early December through Late March. Enjoy reading these four full seasons of past newsletters through the links on the "Newsletters" page.